A hidden gem in the Indian Himalayas, Gulmarg boasts the world’s highest gondola to the summit of Mount Apharwat at 3,979m. Located in Kashmir, the northernmost region of India near the Pakistani border, Gulmarg ski resort makes the ultimate under-the-radar ski destination for powder hounds looking for untapped off-piste slopes. With lift-accessible descents in endless bowls for skiers to conquer, the lesser-known terrain of Gulmarg could rival any heli skiing terrain. And given the heavy snowfall, you’ll almost never repeat the same track and experience plenty of fresh powder minus the crowds. Nestled in the Himalayas, The Khyber Himalayan Resort & Spa is a haven of pampering 2690m above sea level, combining luxurious spa treatments at The Khyber by L'Occitane, fine local cuisine and vintage style cottages with astounding snow mountainscapes. Tatler Tip: Keep an eye out for foot prints of snow leopards on the slopes—you might even spot one of the elusive wild cats if you’re lucky. Once a little-known ski destination catered mainly to the domestic market, Pyeongchang stepped into the spotlight of the world’s winter sports scene when it hosted the 2018 Winter Olympics. One of the most outstanding resorts in Pyeongchang is Yongpyong, South Korea’s biggest ski and snowboard resort where some of the country’s widest slopes can be found. Here, you’ll find 28 extensively varied slopes for skiers of all levels. The Rainbow slope is the highest, towering at 1,210m, while The Rainbow Paradise is known to be the longest at 5,600m. Meanwhile, the 700-metre Mega Green has a gentle slant at only 12 degrees, making it an ideal spot for beginners. Located at the foot of Mt. Balwangsan—only a few steps from the main lift—is the main hotel in Yongpyong ski resort, offering spacious accommodation options, featuring a spa, sauna and hearty Korean cuisine for those looking for a homelike environment to unwind after earning their turns. Tatler Tip: Go for South Korea's version of après ski while you’re in Yongpyong, which means chugging soju instead of schnapps, replacing fondues with barbecued meats and soaking in jjimjilbang (Korean bathhouse). Levi is the most fast-growing ski resort in Lapland with good reason. 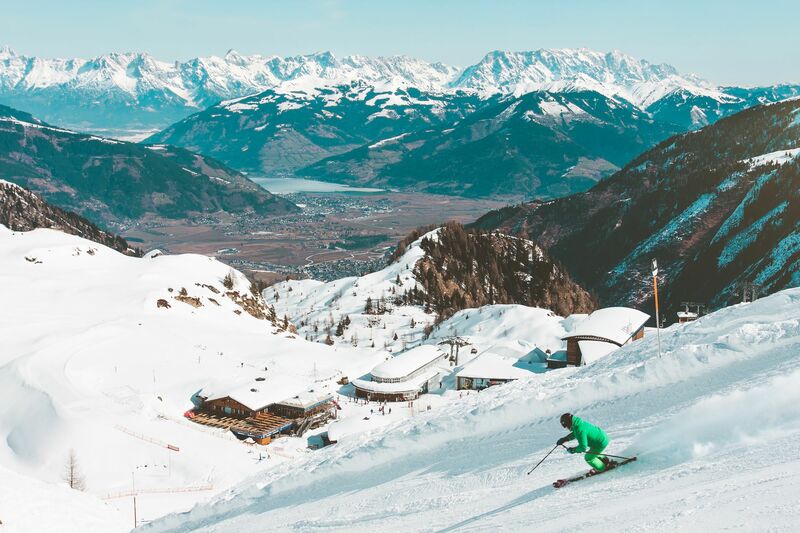 With regular fresh snowfalls and uncrowded pistes, it is one of the rare ski destinations in the world where skiers can pretty much have the slopes all to themselves, making it a fantastic alternative to The Alps. Featuring as many as 43 skiing slopes and 27 lifts, Levi offers an unforgettable skiing experience for both beginners and experienced skiers, and guarantees short queues even during peak season. That also means plenty of downhill time for skiers to explore the snow village of Levi's wide choice of mountaintop restaurants and bars overlooking snow-sculpted forests, shopping outlets and recreational activities. For a truly special experience in Levin, stay at one of the 24 glass-roofed domes of Levin Iglut where you can drift off to sleep in a plush, warm bed while admiring the starry Arctic sky and even the Northern Lights if you’re lucky. Each of the luxurious igloos feature a small kitchen, en suite bathroom and Wi-Fi connection for a hint of home on the edge of the wilderness. Tatler Tip: Head over between November 16-18, 2018 to catch the Alpine World Cup, a prestigious race that has attracted ski enthusiasts from around the world over the years. Stay around for Lappish side events for an exotic cultural experience while you’re there. Lebanon might not be the first place that springs to mind when it comes to a ski holiday, but the country is, in fact, home to six well-established ski resorts just a few hours away from Beirut. Throw in the Middle Eastern culture, hospitality and pristine slopes and you’re in for a dream ski adventure. If you only have time for one location, head over to Mzaar, the region’s largest ski resort. With 20 chairlifts, 50 runs and 8,000 acres of terrain, Mzaar has plenty to offer—including unbeatable views of Beirut, the Bekaa Valley and the Anti-Lebanon mountains. Favoured by advanced skiers, Mzaar boasts some of the country’s most challenging slopes, with an elevation of up to 2465m. Gentle, low pistes also make it an ideal spot for first-time skiers to learn the sport. Less than an hour away from the capital city and nestled amid snowy summits at 2000m up Mount Lebanon, InterContinental Mzaar Lebanon Mountain Resort & Spa is the only five-star ski resort in the Middle East. The resort features 140 luxuriously adorned guest rooms and an impressive range of amenities, including an indoor heated swimming pool, jacuzzi, sauna, steam room, kids’ fun centre, cinema and a small shopping arcade. Don’t miss out on its 1200-square metre “Les Thermes du Mzaar” spa, where guests can enjoy medically supervised treatments such as balneotherapy, aromatherapy and pressotherapy. Tatler Tip: Be sure to try some authentic Lebanese food during your stay. The mountain village of Faraya is especially known for its saj (Lebanese flatbread), which can be found at the locally popular bakeries at the Faraya roundabout on the way to Mzaar. Just 30 minutes from Almaty city centre in the mountain range of southern Kazakhstan, Shymbulak is the largest ski resort in Central Asia—an off-the-radar destination that attracts even the most discerning skiers (Prince Harry has been spotted on the slopes of Shymbulak). Rising above sea level at 3200m, the resort boasts the third-longest gondola in the world at 4.5 kilometres. Adventurous skiers should look into the option of private heliskiing to take advantage of the lonesome mountains and untouched slopes. Well-to-do Kazakhs and expats living in the region are frequent visitors of the resort, thanks to its exceptional selection of dining, lodging and entertainment options for skiers and holiday-goers. Steeped in the culture of an ancient Silk Road city with a sense of the vibrant city where it is placed, The Ritz-Carlton, Almaty features 145 spacious guest rooms and suites. Stop by the sophisticated Sky Lounge and Bar on the 30th floor for a drink complemented by sprawling views of the Kazakhstan's largest metropolis and Tian Shan Mountains. Tatler Tip: The Ritz-Carlton, Almaty can arrange a ski butler for those who need advice on selecting and renting equipment and recommendations on the best mountain slopes to ensure a hassle-free skiing experience. Known as the host of the 2014 Winter Olympics, Sochi is surrounded by some of the most prestigious ski resorts in Russia. One of them is Rosa Khutor resort, an alpine skiing paradise n the mountain cluster of Krasnaya Polyana that draws scores of winter sports enthusiasts every year. Rosa Khutor has a base elevation that is 560 meters above sea level and a lift-accessible summit at 2,320m, allowing alpine skiers a vertical drop of over a mile long. The infamous “black” piste located between located between 1350m and 2320m are designed for even the most expert skiers and snowboarders. Surrounded by the magnificent snow-capped mountains at an altitude of 960m above sea level, Rixos Krasnaya Polyana Sochi is especially known for its world-class spa, which features a swimming pool with hot tub, Turkish hammam, sauna, fitness centre and a VIP area. The hotel’s 114 rooms and suites are thoughtfully designed to blend in with the mesmerising nature of the Caucasus. Tatler Tip: Rixos Krasnaya Polyana Sochi has a storage room for guests to dispose skiing equipment and offers modern ski gear for rental. First-timers can opt for ski tours and mountaineering training arranged by the hotel’s professional native mountain guides. While snowsports might not be something we normally associate with Africa, the High Atlas mountains in Morocco is the continent’s best kept secret for a winter holiday. Located 80 kilometres south of Marrakech lies Oukaïmeden, Morocco’s largest and most well-equipped ski resort perched at 2,600m. The resort’s single chairlift rises to a maximum elevation of 3,232m at the peak of Jebel Attar. From the top, five off-piste downhill runs await, the longest of which is three kilometres. These runs are not for the faint hearted as you’re greeted with a vertical drop of 1,000m once off the chairlift at the peak. Nursery slopes on the other hand, cater to less experienced skiers with gentler terrain where ski lessons take place. A luxury alpine chalet in the majestic mountains of the Middle Atlas, Michlifen Resort & Golf boasts an eclectic variety of rooms furnished in distinctive interiors, from elegant Nordic, rustic American, earthy Tyrolean to classic Savoyard, adding touches of Moroccan warmth and refinement. The hotel spa's Hammam bath is a must-try Moroccan ritual that takes you through a series of luxurious and rejuvenating treatments. Tatler Tip: If skiing on African slopes is not enough for the intrepid adventurer in you, a heli skiing experience at a drop of over 13,000 feet should suffice. Heliski Marrakech, the only heli-ski operator in Africa, takes skiers to secluded slopes above the village of Setti-Fatma, far away from ski treks.